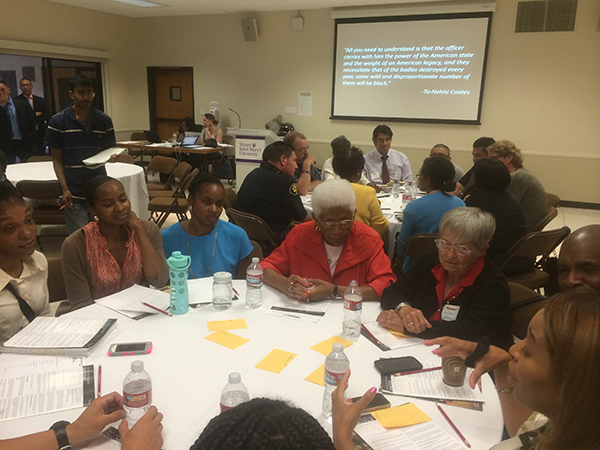 On August 11, 2015, The Institute for Non Violence in Los Angeles and Days of Dialogue program kicked off a citywide discussion to address “The Future of Policing”. Days of Dialogue is designed to address contentious topics and challenging issues within local and national communities. 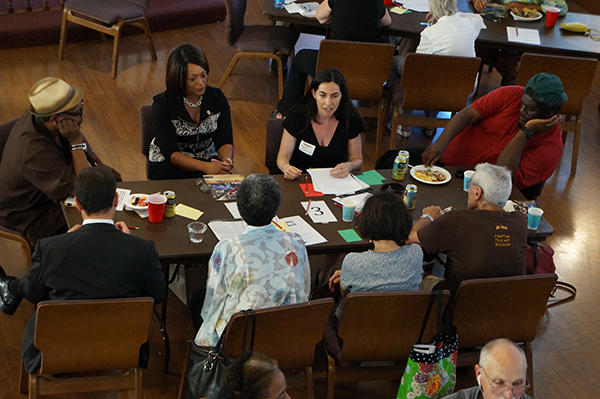 Close to 900 people participated in dialogues hosted at 12 sites across Los Angeles County. In efforts to have a honest dialogue, trained facilitators, mediators and experienced volunteers from the L.A. City Attorney’s Dispute Resolution Program, founded by Avis Ridley Thomas and Mediators Beyond Borders worked with host organizations in various parts of the city to create a safe space for community members, police officers and first responders to have open dialogue by establishing mutual ground rules, respect and resources to further address the concerns of the this polarizing topic, “The Future of Policing”. Indeed, it can seem unnatural for individuals who have lost loved ones or manage fatal crisis on a regular basis to be calm for three hours. However, Days of Dialogue encouraged community residence to operate from a process of peace even though majority of the circumstances were carried by heavy burdens and worry. Overall, according to Days of Dialogue Participant evaluations indicated, 97% of participants indicated that they felt free to express their views on all issues and that their views were heard and that dialogue has a powerfully positive effect on the community. As Days of Dialogue continues, it is evident that living in fear of law enforcement traumatizes the Black community and the road to rebuilding trust is deep-rooted but not impossible. Take a first step, have a heart led conversation.